Powers/Abilities: None. Annabelle has no special skills, beyond being loyal and courageous, and looking pretty. History: Annabelle St. John grew up in the mid 19th Century in Savannah, Georgia, the daughter of a wealthy slave owner. Shortly thereafter, she was called back home to be with her family in the time of the Civil War. 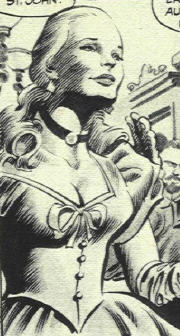 (Tomb of Dracula II#6) <September 13, 1862> - Dracula, infatuated with Annabelle, traveled to the US to meet with her. Traveling to her father's plantation, Dracula arrived at a fund-raising party he was holding for the Confederate army. He bid $1000 in gold--and won-- to dance with her. Despite this, Annabelle's father rightly felt unnerved by Dracula, and agreed only to let him see her with the benefit of a chaperone. Dracula met with Annabelle the next day, heavily clothed and even briefly bearing the pain of sunlight for the chance to see her again. Dracula told Annabelle that he loved her, and asked her to return to Transylvania with him. Although Annabelle, too, felt strong feelings for him, she felt she could not leave until her brother and father returned home safely from a battle they had just left for. Dracula knew that the Union forces were superior for this battle, and that Annabelle's father and brother would most likely be slain, and their land would be in enemy hands. 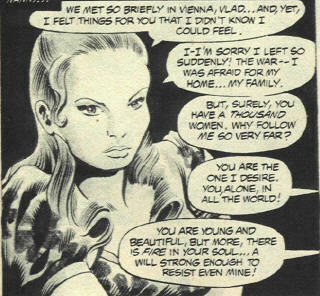 Dracula asked her if he could prevent the invasion and save her family, would she return to Transylvania with him. She agreed, little guessing he actually had the power to make a difference. That evening, Dracula found a group of 99 rebel soldiers and, combining them with animals under his command to form a Legion of the Damned. He sent these mindless, fearless warriors, under the cover of a dense fog, to ambush the nearby Union camp, which they swiftly overran. with Dracula's aid, the camp and all in it were slaughtered. When Annabelle's father and brother, having seen Dracula in action, returned home, they learned of Dracula and Annabelle's promises. That evening when Dracula returned, the Confederate soldiers ambushed him with a garlic net, held him with crosses, and staked him through the chest. A nearby Innkeeper had read up on vampires and they planned to complete the full rites of vampire destruction at dawn. However, Annabelle remembered her promise and sneaked out and pulled the stake out of Dracula's chest. She told him that she realized that he could have taken her by force at any time, and that maybe he did really love her. They then headed back to a ship, to return to Transylvania. Comments: Created by Jim Shooter and Gene Colan. A group of 99 Confederate soldiers mentally enslaved by Dracula and combined with an army of vermin--countless thousands of the foulest, basest creatures of the marsh (snakes, rats, bats, etc. ), also under the sway of the dark lord. Though Dracula had no intention of getting involved in the Civil War, nor any interest in its outcome, he did so for Annabelle, so that she would return to Transylvania with him. 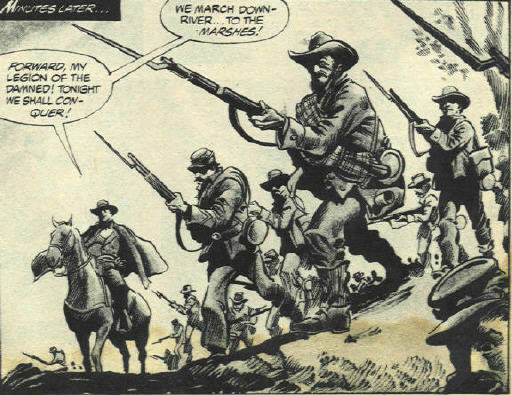 Under the cover of a dense fog, the Legion made it the whole way to the nearby Union camp before being seen. Caught unaware, the Union soldiers were unable to stand against the Legion, who felt neither terror nor pain. The Legions slaughtered the Union soldiers and burnt their camp to the ground. The Confederate soldiers were thus spared from certain death at the hands of the superior forces of the Union troops in this conflict. After the slaughter, Dracula returned the thirteen survivors of the his Legion to their former camp, where he released them form his control, with no memory of what had just happened.